LiveGrade offers the possibility to transfer CDL grades to Assimilate Scratch through an ALE file. This feature will help you to match the grades with each clip automatically using their metadata information. In addition, there is the advantage of having all the grades in one single ALE file. As long as camera and scene information are entered for each grade in LiveGrade, the exported ALE file will transfer the metadata along with the CDL values to automatically apply the grades to each clip in Scratch. In order to start the ALE export, you have to select the Grade Group from the LiveGrade library. 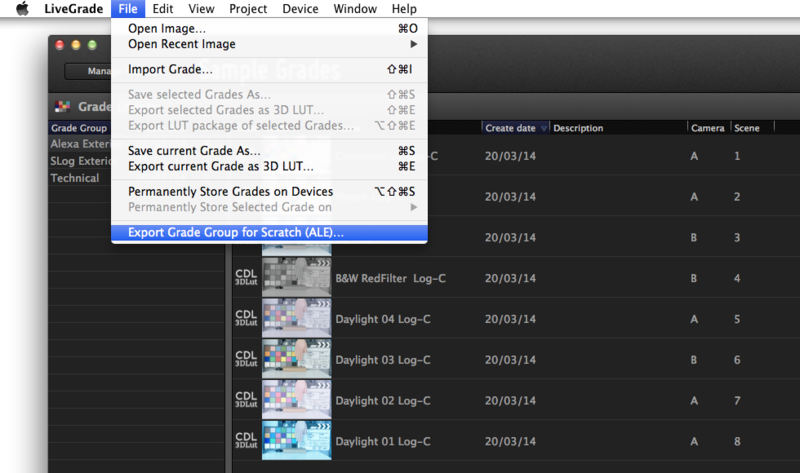 Then select File>Export grade Group for Scratch (ALE) as shown in figure 1. Once the ALE file has been saved, you can load it into Assimilate Scratch to match the grades with the clips. SCRATCH: LiveGrade part2 from ASSIMILATE on Vimeo.